Unfortunately for the University of Hawai’i basketball team, a game still requires two halves. 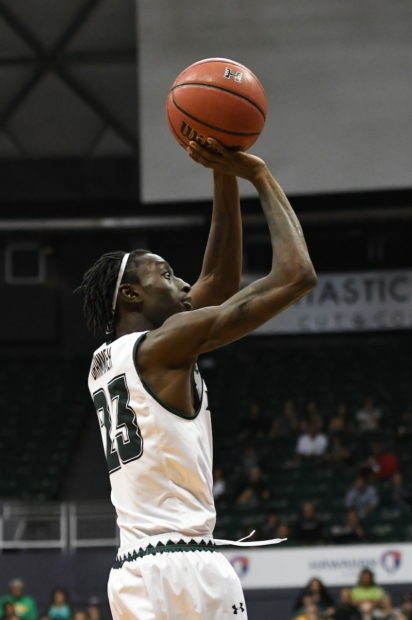 The Rainbow Warriors’ struggles in the first half were too much to overcome in a 67-56 road loss at UC Irvine on Saturday. The Warriors shot 25 percent from the field and fell behind by 15 in the first half of the Big West Conference loss at the Bren Events Center in Irvine, Calif. Hawai’i adjusted in the second half, but could never catch the Anteaters. Hawai’i dropped to 14-9 overall and is now in fourth place in the Big West at 5-4. UCI improved to 21-5 overall and remains in first place at 9-1. The Anteaters swept the season series with Hawai’i, including a one-point win in Honolulu last month. Jack Purchase and Sheriff Drammeh led the Warriors with 11 points each. They each made three 3-pointers. 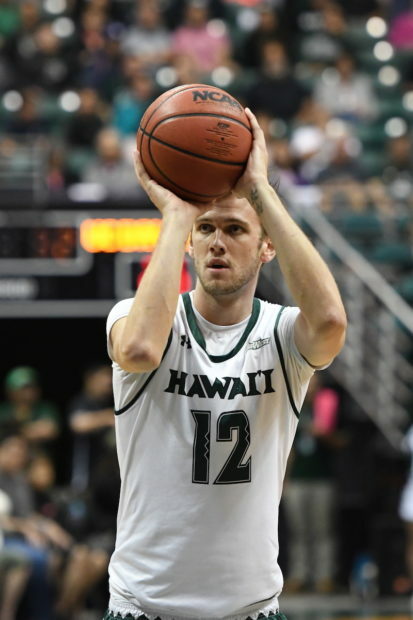 Purchase now has 179 3-pointers in his UH career, one away from tying Zane Johnson’s school record of 180 set from 2010-12. The Anteaters used an 11-1 surge late in the first half to take control with a 24-12 lead with 4:36 remaining. UCI’s Evan Leonard hit a running 3-pointer as the halftime horn sounded to give the Anteaters a 33-18 lead at intermission. The Warriors shot just 6 for 24 (.250) from the field in the first half, including 3 for 10 from 3-point range. They also went just 3 for 6 on free throws, and got out-rebounded, 22-13, in the first 20 minutes. Hawai’i opened the second half with a 10-2 run to cut the UCI lead to 35-28. The Warriors got as close as six, 52-46, on a 3-pointer by Drammeh with 7:19 remaining. But the Anteaters responded by scoring the next six points to regain control of the lead at 58-46. Point guard Drew Buggs finished with eight points and nine assists for the Warriors. Senior guard Brocke Stepteau added nine points, although he shot 2 for 8 from the field. The Anteaters entered the game limiting opponents to a .384 field goal percentage for the season, and UCI head coach Russell Turner credited his team’s defense for the Warriors’ first-half struggles. Max Hazzard led the Anteaters with 13 points, but the play of UCI big men Jonathan Galloway and Elston Jones was significant. Galloway, a 6-10 senior, had eight points on 4-of-5 shooting and grabbed 13 rebounds; Jones, a 6-9 senior, had 10 points on 5-of-6 shooting and grabbed 10 rebounds. 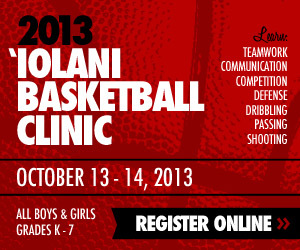 The Warriors are scheduled to return to Honolulu on Sunday. Their next two games will be home conference contests against the two bottom teams of the Big West. Hawai’i will host last-place Cal Poly on Thursday, then eighth-place UC Riverside on Saturday. In the first half, “we didn’t do anything” because the Anteaters played pretty tough defense. The second half doesn’t count because they layed off the tough defense they were playing. They didn’t want to run the score up. In past years there was talk of “starting fast”. I would like to see that brought back again. The talk of it at least. If we can’t start fast then we can’t start fast. But the talk should be, “we couldn’t start fast”, and not first go to ‘offensively a mess, no purpose, no screening, no execution, and playing late clock again’.